There are natural, eco-friendly alternatives for cleaning your concrete patio floor. Vinegar is a fantastic cleaning agent. Mix equal parts distilled white vinegar and water (add a few pinches of salt if you need to scrub away stains). Spray onto the surface, mop and rinse. If you are adverse to the smell of vinegar, add drops of your favorite essential oil to mask the smell. Use vinegar (not diluted with water) on tough stains and scrub with a nylon brush. Again, if you don’t like that vinegar smell, clean stains first then mop with the diluted vinegar solution with added essential oils. Baking soda is a good cleaning alternative as well. Its abrasive texture gives it natural scrubbing power to help remove dirt and grime. Mix half cup of baking soda with one gallon of water and mop the concrete patio floor. If there is baking soda residue, spritz with vinegar to remove. For a stronger cleaning solution, add baking soda and liquid soap to water and use to wash the floor. Rinse with water to combat any residue and let air dry. Hydrogen peroxide is another non-chemical option for cleaning your patio. Simply replace the screw on cap with a spray nozzle, spritz on the concrete patio floor, scrub with wet broom, and now you have a clean surface. If you have any highly soiled areas, spray vinegar over the hydrogen peroxide and scrub with a nylon brush or rag. One quick and easy way to get your concrete patio floor super clean is using a power washer. And it works great for removing mold and mildew too! When using a pressure washer, follow the instructions. Always wear protective gear, including eyewear, boots, and gloves. The water is very powerful and should never come into contact with your skin. Spray evenly and steadily along the patio until all dirt is gone. Choose a pressure washer that is strong enough to clean gaps and stuck-on grime and mold. Is you exterior concrete beyond cleaning? Learn more about our concrete resurfacing services. Get a FREE estimate here. If you're tired of looking at your lackluster landscaping but aren't sure where to begin when it comes to improvement, you may want to give some thought to installing concrete landscape curbing. Real estate agents consistently promote the importance of "curb appeal" when trying to list or sell a home. Homes with high curb appeal (that is, homes that have simple, attractive, and streamlined exteriors, including landscaping) are far more likely to find a buyer quickly than homes that are obviously "fixer uppers" or that will require a bit of work to get in show-ready condition. By installing stone or concrete curbing instead, you'll be able to create a seamless appearance that's aesthetically pleasing. This streamlined and low-maintenance landscaping can catch buyers' eyes, enticing them to come in for a closer look, even if some of your property's features might otherwise have been disqualifying factors. Not only can the curb appeal generated by your new curbs make your home easier to sell when the time comes, it can improve the "paper" value of your home. This can improve your ability to qualify for favorable refinancing and home equity terms, providing you with the cash you need to perform other home maintenance or improvement projects without dipping into your savings or taking out a higher-interest personal loan. ​One of the chief benefits of landscape curbing is its subsequent reduction in weeds. Not only can having a solid border between grass and garden prevent grass seeds and other unwanted intruders from putting down roots where they shouldn't be, it can make it much easier to trim any weeds or tall grass that does make it through this initial barricade. Because concrete curbing is designed to stand up to the elements, it is also well-equipped to any abuse a lawnmower (even a riding or zero-turn mower) or weed eater can dish out, remaining stable and strong even when in direct contact with the blades. This can allow you to mow or weed eat directly against the edges of your curbing, enhancing the neat and trim appearance of your lawn and garden. Installing new landscape curbing is almost certain to improve the appearance of your home while improving (and retaining) home value and saving you time on lawn and garden work. Want to know about our landscape curbing services? Call us today at 760.772.6849 or receive a FREE ESTIMATE here. The versatility of stained and resurfaced concrete makes it the ideal flooring solution for interior floors like bathrooms, kitchens and family rooms that receive lots of wear and tear. The durability of all three decorative concrete finishes will keep your indoor floors carefree for years. Your new concrete floors will stay looking like new by regular dry dust mopping and an occasional wet mop cleaning with a neutral pH cleaner. Colors will not fade, and finishes don’t chip, stain or peel. Decorative concrete floors don’t harbor dust mites or other allergens, and are moisture resistant so they prevent the growth of mold or bacteria so your home stays cleaner and safer, especially important for those suffering from allergies or asthma. Interior floors can look like polished marble, real stone, tile, wood plank, brick, slate, Flagstone and much more. You have practically unlimited design potential with our realistic stamp patterns, custom hand-cut and colored overlays and the wide range of acid-based chemical and water-based acrylic stains for stunning effects. Want to add value and beauty to the inside of your home? 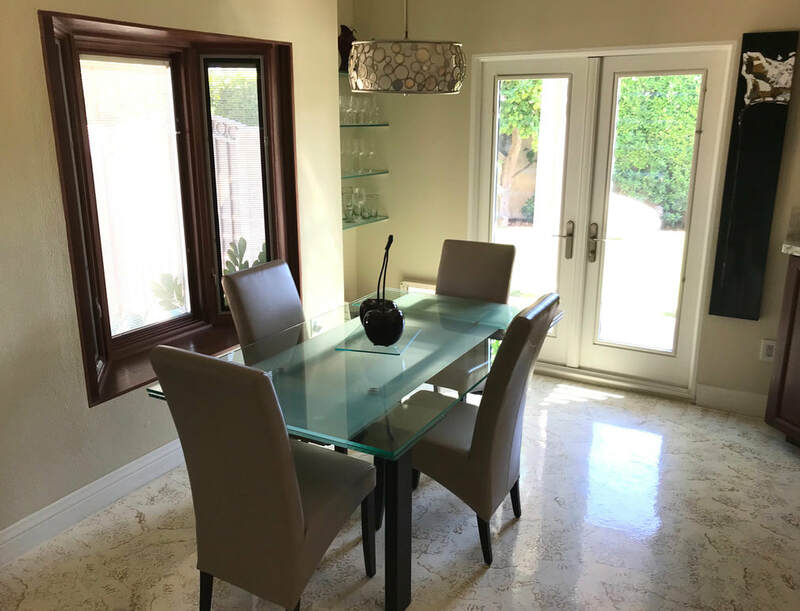 Call the pros at Econo-Crete today at 760.772.6849 or get a FREE ESTIMATE here. Compared with other types of flooring, especially carpet, resurfaced concrete floors are a breeze to clean. When protected with a sealer, they resist stains and abrasion. However, concrete floors aren't completely maintenance free, and you'll need to clean the surface regularly to keep it looking its best. To clean interior concrete floors. Dry dust mopping and occasional wet mopping with a neutral-pH cleaner will keep your floors looking great. For floors that need deeper cleaning to remove stains, try using a stronger soap or a solution of soap plus ammonia. If your stained floor begins to loose its luster or shine, rewaxing will usually revive the appearance. In high-traffic areas, you may also need to reapply the sealer. Talk to us for recommendations about the best type of cleaning and sealing products to use on your floor. To clean exterior stained concrete. Keep the surface clean by sweeping it with a broom or leaf blower or rinsing with a garden hose. To remove stubborn dirt, scrub with a mop or medium-bristle brush and a mild cleaner. To keep exterior surfaces protected, apply a new coat of sealer every year or two, or as necessary. Want to know more about our concrete resurfacing services? Get a FREE estimate here.